Now, this is a Hanoi institution, and deservedly so. Food runs out by eight, so you'll want to get here early. There's only 1 item on the menu-perfect for the indecisive like me- and if you look non-Native, expect to be given a laminated sheet which tells you as much. 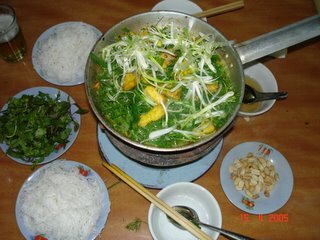 What it is is this: a saucepan of fish cooked in butter sauce, accompanied by a bowl of springy rice noodles, a huge portion of greens and a small bowl of fish sauce (the magic ingredient). Oh yes, and roasted peanuts for an added crunch. It would seem that what you did with all of this was up to you, but after a few considered moments watching those around us, we threw the greens and peanuts in with the fish, wet the noodles with the fish sauce and then drowned them in the fish/veg mix. The rich butter sauce just perfectly offset the slightly tangy fish sauce. And it was so light, we finished three full portions between the two of us.